Pablo D'Stair of Brown Paper Publishing is unlike anyone I've ever met. He's kind, passionate, smart as hell, kind of tall, dedicated, and generous damn near to a fault. He's been publishing work for a few years now, creating an eclectic mix in a catalog that's growing by leaps and bounds. Pablo describes BPP as a "not-for-profit" press, and he means exactly that: All of the titles are available as FREE PDF DOWNLOADS, and the PRINT COPIES ARE SOLD AT COST, somewhere in the range of $5-$8. AND if you want a free copy in exchange for feedback, he's willing to do that, too. What? Who does that? Pablo D'Stair does that. Because he loves literature. Because he loves you. And now Pablo gives you The Predicate Dialogues, "in depth dialogues with independent literary artists dealing with the subject of personal literary purpose, volition, craft, and interpretation." 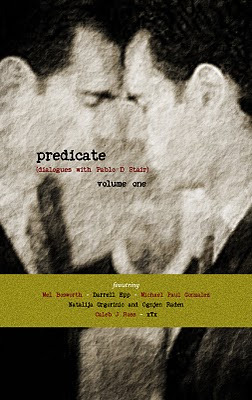 The March 2010 edition of Predicate features dialogues between Pablo D'Stair and Caleb J. Ross, Darrell Epp, Michael Paul Gonzalez, Natalija Grgorinic & Ognjen Raden, xTx, and Mel Bosworth (that's me). I was thrilled for the invite, but I couldn't have anticipated the challenge. Pablo likes to play as hard as he works, and it shows. Predicate will challenge the reader as well as entertain. And that's what it's all about. Tremendous thanks to Pablo for putting all of this together. Predicate is available as a free PDF download HERE and/or you can purchase the 350-page print edition HERE. Knew you couldn't hold out! shut up. it's ross's fault. HUGE thanks, eric. you win a prize (i'm not sure what yet) for reading.